As many of you know, the L.A. area has always had a shortage of superheroes, who tend to congregate in the more vertically-oriented and subterranean East Coast towns. Even Tony Stark spent his first couple of decades on Long Island before relocating to the L.A. area. So it’s refreshing that Supergirl has taken up residence in National City, a thinly-disguised version of Los Angeles. See the rapid bus in the background at right during a recent Kara Danver coffee run on behalf of her media website. Here’s the thing. If, for example, a seven-stomached space blob descends from the heavens above and decides to munch on a subway train or rapid bus, we would certainly appreciate some assistance in heading off the potential service delay. In the two episodes thus far, Supergirl has saved a commercial jetliner, important bridge, the port, a Nat City ambulance and stood up to Sadie Stone from Nashville (that last one isn’t saying much). Supergirl hasn’t save a single bus or train yet, which is usually a key component of any superhero’s portfolio. So here’s my advice: Kara Danvers/Supergirl should wander over to the nearest National City Metro station, grab a TAP card and get busy saving something like the Gold Line trestle over the Arroyo Seco or fighting a baddy in that big, empty ticket room at Union Station (nice light!). If a superhero wants to win over the masses, there’s no better way to start than saving mass transit and showing little girls how to use their first TAP card. And if Supergirl needs any assistance or has any questions, she should feel free to contact me personally. Batman saved the Gotham subway/monorail thing in the first movie of his recent trilogy. Smart! Speaking of superheroes on the Metro…. Which train is it? A Blue Line train bound for Long Beach or Expo Line headed to Culver City? The signs on the trains say it’s both. This is a complaint with which we’re not unfamiliar. I’ve asked our rail ops folks for a response. 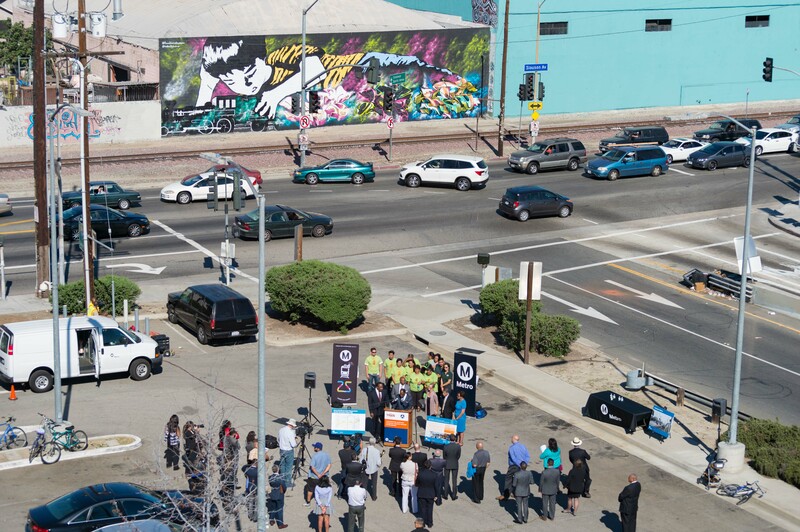 The media event last Thursday in the parking lot for the Harbor Transitway’s Slauson station. Photo: Steve Hymon/Metro. Good coverage of the announcement last week that the project to convert the old Harbor Subdivision rail tracks to a walking and bike path got a $15 federal grant. That will help pay for a 6.4-mile segment between the Crenshaw/LAX Line, Harbor Transitway and the Blue Line with a later segment to connect the path to the L.A. River. Sahra Sulaiman writes that community engagement will be crucial to making this project a worthy one and lists some of the many challenges involved — including visibility. The Eighth Street side of the new Whole Foods. Photo by Steve Hymon/Metro. More evidence that the gentrification of DTLA is picking up steam with the addition of a new transit-oriented-grocery (TOG). The upscale grocery will have 170 parking spaces and will deliver via bicycle. Hard not to notice 1: the nice, wide sidewalks and excellent street lighting outside the store on 8th Street and Grand Avenue. Very different than much of the rest of DTLA. 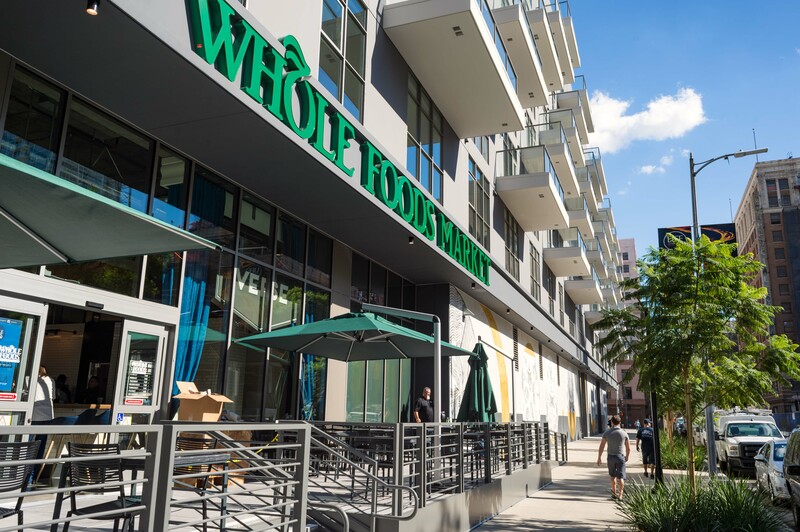 Hard not to notice 2: the rents for the new luxury apartments built above the Whole Foods begin at $2,150, according to the eighth & grand website. The average household income for Metro bus riders is $14,876 and for rail riders $19,374, according to Metro’s latest customer survey, btw. With city finances in better shape, a group is imploring city pols to drastically reduce the cost of parking tickets — which in recent times have been used to help fill depleted city coffers. Good article on public policy. On the one hand, the fines are very steep, especially to low-income motorists. On the other hand, the L.A. Council recently gave initial approval to an ambitious (and presumably pricey) plan to add bus and bike lanes, has a Great Streets initiative and a variety of other transpo and planning needs. And that money has to come from somewhere unless the Magical Money Tree has been discovered. Wonk out on this story from the Twin Cities that notes that ridership projections across the country have been slightly better this century than last. 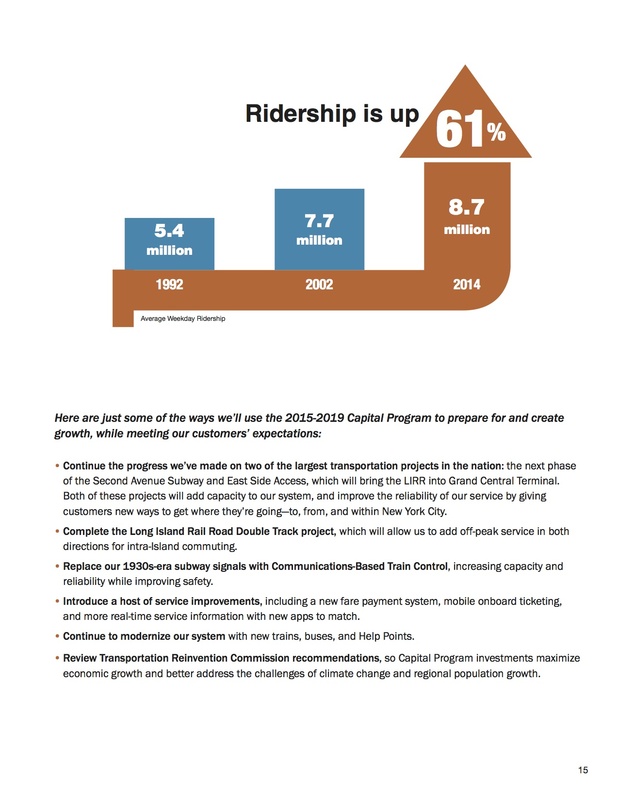 One difference: some agencies are thought to underestimate ridership, perhaps in order to later boast the project is more popular than initially thought. The passage that caught my eye: that a planned rail line in the Twin Cities could deprive another future rail line of ridership (I’ve heard this theory applied to the Expo Line and the Purple Line — i.e. if they ever got too close, they would deprive each other of riders). Perhaps, if you believe there’s a finite percentage of people who will take transit. The other view: as you build more transit and saturate a community, the more riders it will attract because it’s so convenient to so many people. Speaking of confusion, other than the Expo vs. Blue Line, this whole internal humor of “Manhattan/San Francisco East” or “San Francisco/New York West” that no one outside of The Source writers sees as funny or amusing should also be dropped. From a reader’s (taxpayers) standpoint who read this stuff, it’s not humorous, it causes more confusion and it’s definitely not professional. And it pretty much points out that Metro really doesn’t care about confusing people if they see using Manhattan/San Francisco East or whatever as humorous. San Francisco is San Francisco. Los Angeles is Los Angeles. If you want to inject humor into your articles, go work for the private sector. The Source is a taxpayer funded news site relating to mass transit issues, not the Hollywood Reporter or Variety. Relax, the real waste of tax dollars would be if the writing were boring and nobody paid attention. If there’s anything we should be taking offense at it’s infrequent transit service and mediocre bus stops. I think the simplest way to avoid confusion on what line it is, especially on shared tracks like 7th/Metro is to just use painted trains like Japan does when the Yamanote Line and the Keihin Tohoku Line shares the same platform, you never get confused because the former trains always have a green cheat line and the latter has a blue cheat line. I understand Metro wants to keep the trains colorless (or wrapped with ads) so they can mix-match as a cost saving measure, but Metro also needs to consider that as shared tracks become more common (likely be the case along the Regional Connector stations when they open), confusing the passengers is far more detrimental to the reliability and trustworthiness of Metro than cost cutting measures such as being able to mix-and-match the trains which is a more of a “behind the scenes” measure that more to the benefit of Metro, not the passenger’ experience. 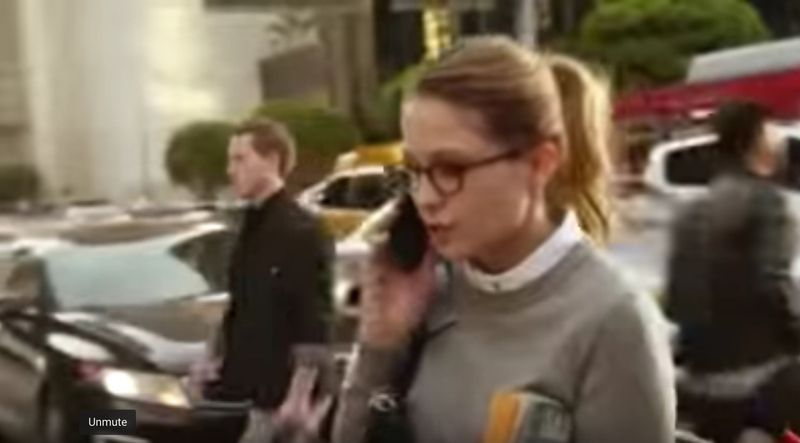 Supergirl uses TAP cards? Must be slow news day for transit. I think there are far interesting transit related news like the Uber driver in OC who was viciously attacked and had to use pepper spray to defend himself, and the perpetrator was found to be a Taco Bell executive and was subsequently fired. You mean this one? It’s definitely a fun ad! Metro needs to clean up the signage and operational issues for both the both of the Blue & Expo Lines before the Regional Connector opens. This is a teaching moment to Metro. Well, when the Regional Connector opens, the Blue Line will run through to Pasadena and points east, the Gold Line will run from East L.A. to Santa Monica, and both the Expo Line and the current East LA to Pasadena alignment of the Gold Line will go bye-bye, so that should relieve the signage issues (and the turnaround bottleneck at 7th/Metro). Trains will presumably run the full day on the same route, without the present business of a Blue Line consist rolling into 7th/Metro, then rolling out as Expo Line, or vice versa. The Boston “T” and the Chicago “L” both have forked lines, with both (or all four, in the case of the “T”) branches sharing a common color and a common trunk line, without anybody getting confused. The Muni has its J, K, L, M,N lines (and until the new Central Subway opens, “S” and “T” lines as well) running through the upper Market Street Subway, with K, L, M, S, and T continuing through the much older Twin Peaks Tunnel (sometimes with cars on multiple routes consisted together, to be split at the West Portal), and BART has Red, Yellow, Blue, and Green lines sharing the lower Market Street Subway and the Transbay Tube. I have every confidence that the Metro can get its act together, but remember, all of those cities have had at least some form of urban rail for over a century, and even BART is over 40 years old. Southern California was without urban rail for close to three decades, between the closure of the PE and the LARy, and the opening of the Metro Blue Line. Compared to the other systems I cited, MetroRail is still a baby, barely even a toddler. James: According to the on-going marketing campaign, MetroRail turned 25 this year. This baby is now old enough to drink, vote, attend R-rated movies, and even rent a car! We customers deserve good service, and we deserve some accountability if that service isn’t forth-coming. We shouldn’t be expected to wait another five years for the Regional Connector to be completed before we can get reliable information about the next train. Metro went to the expense of purchasing, installing and maintaining these communication technologies, its about time they learn to use them properly.